My favorite sites to use for extra money are almost always going to be the ones that don't make me wait long to get paid. I like to hit that cash out button and get paid as soon as possible after I see I have money waiting for me in my account. I thought today would be a good day to make a list of some of the sites and apps that pay you the fastest. If you know of any others I didn't list, please share them below in the comments. This is a new addition to the list and one I'm pretty excited about. At OneOpinion you'll be taking surveys for points that you redeem for rewards. Once you get to 25,000 points ($25) you can cash out instantly for virtual gift cards or PayPal cash! You can also opt to receive a physical Visa gift card through the mail. If you don't qualify for a survey, you still get some points for your time spent and the best part is points are instantly credited to your account once you complete a survey so you don't have to wait weeks or months for them to post. Click here to sign up or read our One Opinion review first. I've talked about this smartphone app quite a lot, and it is one of my favorites to use. How fast they pay is one good reason why I like them so much! You use it while you are out shopping. They have a lot of products listed on their offer wall, mostly grocery products, and if you buy those while you're out, you can upload your receipt to Ibotta and they'll pay you back some actual cash for proving you bought the item(s). You only need $20 to get paid to Paypal, and they send it almost instantly after you request it. Go here to sign up or read our Ibotta review first. This is a survey panel that pays $3 a survey. You can expect your money within a day if you choose Paypal or within a few days if you're mailed a paper check. They're easily one of the most popular survey panels around and have been in business for a very long time. They are not always open, but you should be able to try to sign up now. Also, check out our Pinecone Research review for a little more detail on the panel. One of the best! This is basically the most popular reward site, and they've paid out over $40 million dollars to users since they got started. I've used this site and been paid many, many times. Amazon and Paypal are the two most popular options for redemption, although there are other things to choose from, too. You only need 500 SB in your account to get a cash out on Swagbucks, and it's realistic to get a couple every week if you use this site consistently. Payouts are also fast. You can expect a payment sometimes within 48 hours, although it says in their terms to give them up to 10 days. Get a $5 bonus when you sign up for Swagbucks here. You can also check out our review of Swagbucks if you'd like to learn more about it first. This is very highly rated survey panel. They didn't pay that fast before, but they've made some changes and now if you request a Paypal payment from them, you'll usually see it within a day or sooner. You have to have $10 to cash out to Paypal. Go here to sign up or read our Opinion Outpost review first. Another fantastic survey panel that still pays users in cash, not redeemable points. In the past, this site only paid out via check, but they've recently added Paypal as an option. Also, Paypal payments here are much faster than if you request a check. If you cash out via Paypal, you'll see your earnings sometimes within 5-10 business days. Go here to become a member at Mindfield. This panel is not always open to new members. If you want to make some extra spending money via Amazon gift cards from your phone or tablet, this is a great app for it. Users are able to hit the cash out minimum of $10 quickly and once you have that amount, you can get your gift card code immediately upon request. Go here to download the app on your Android or iPhone and get started. This is a simple browser addon that you install and it will present you with a side bar full of relevant products to click on when you perform a search for something. Clicking on the items will reward you with a few cents or as much as a dollar. They now offer surveys as a way to earn, too! You can install the Qmee addon in Chrome, Firefox, Safari, Internet Explorer and Opera. 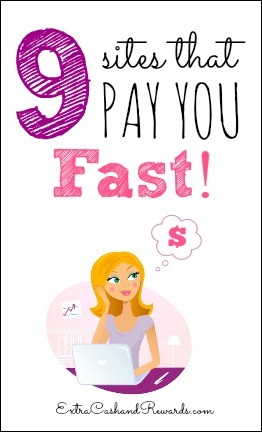 The pay is basically instant and you only need a penny to cash out! It goes straight to Paypal within a few minutes, usually. Go here to register at Qmee, or read our Qmee review first to learn more about it. Another survey panel that pays fast, but you do have to have $15 in your account before you can cash out. This can take a while to reach if you don't have a lot of referrals. They are owned by the same people that run Instant Cash Sweepstakes. Typically payment comes to Paypal the same day you request it, although it has taken up to three days before. Go here to get started at Paid Viewpoint or check out our review sharing our experience with Paid Viewpoint. This is another rewards site like many others, but definitely worth signing up for if you like instant payments. Complete surveys, offers, play games and more to earn cash. Once you've earned as little as $1, you can cash out immediately and get Paypal money or gift cards from hundreds of online stores, including Amazon. Also, if you're looking for jobs for teens, you'll be happy to know this site lets you sign up as a teen with parental consent. Go here to get started with InstaGC. So the sites above might be good to use if you need access to a few things where you don't have to wait long redeem. Do you know of any others? Please share in the comments! Inbox Pays, at least for me, doesn’t seem to be worth the time. The cash out threshold is high at $50, and you have to do more than just read emails to get paid. You have to also complete offers. According to PTC Investigation (I site I generally trust for reviews of sites like Inbox Pays), you also have to talk to them on the phone in order to verify your account and get paid. Inbox dollars is a great app for me. The payout is actually $30.00 and I cashout at least twice a year. I’m coming upnon one soon. I use my cashouts to stock up on canned goods or toiletries. I don’t know if any of you have ever went to Clickworker to make a little extra money. I just started that a few days ago just to see what was available for jobs. Have any of you heard of this company? I have heard that they are very reliable and pay on time. Here is my referrel link in case you want to sign up. It is really easy to get a job on there and stop whenever you want to. Thanks for taking a look. Anna, have you ever tried this out? I promise I am not a spammer. I come here all the time. Hi Dana, I have never tried Clickworker but I do know about it and have heard that it is reputable. Great post! I use QuickRewards and they’re my favorite because there’s no cashout minimum. I also write for HireWriters.com, you write articles for them and they pay you. Payout is only $10 and they pay every friday via paypal. Savingstar pays quick. I have only used thecoupons but when u get $5 they will payout even to your checking account! I use Qmee and Postloop and they do pay out really fast. Granted I can’t see a way they’d produce a livable amount of money- they’re still awesome sites to earn a little extra fast with. Mainly I know mu bills are coming up and I’m just a few bucks shy. Thanks for making this list! Does anyone have any experience with Panda Research? They are a lot like inbox dollars as in you click on paid emails, complete surveys and offers. Says their payout is $30, I’m at almost $35 and it’s telling me I don’t have enough money for payout. I do a LOT of online surveys and I found a few sites that will pay instantly with anywhere from $.01 to $2 in your account. Rewarding Ways, Offer Nation, Dollar Clix…My favorite one is Survey Savvy, although, at this time, they only pay by check. Another way to earn some quick cash is by writing articles for Hire Writers. You only need $10 in your account and you can get that by writing a few short articles. They pay automatically every Friday by paypal.